In two recent races, McCormick automotive student groups used their engineering and problem-solving skills to design, build, and successfully race two different vehicles. 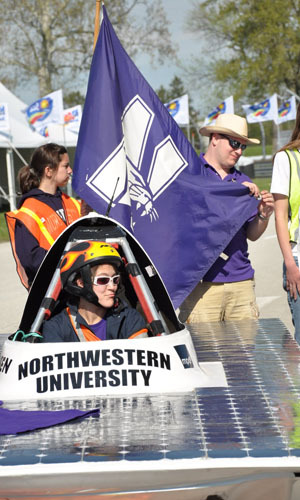 The Northwestern Solar Car Team took third place at the 2011 Formula Sun Grand Prix at the Indianapolis Motor Speedway on May 2-7. The team’s solar-powered car, SC5, performed well throughout the race and completed more than 500 laps. Before the race began, the team passed scrutineering – qualifying trials – with flying colors. The judges were particularly impressed with the car’s new electrical system, the team said. During the race the team faced cloudy and rainy weather, interruptions from school (one team member had to stop driving to take a midterm), a leaky tire, and problems with battery bricks. But at the end of the third day, the team raced to its best finish yet. They even got to accept their trophy on the podium at the Indianapolis Motor Speedway. 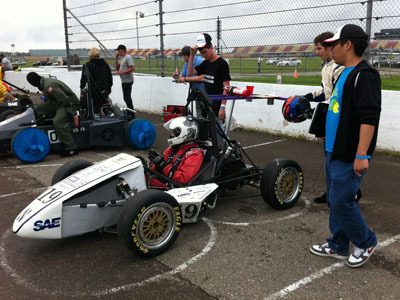 The Northwestern Formula SAE team raced their open-wheel racecar at the Michigan International Speedway on May 11-14. The race, an intercollegiate engineering design competition run by the Society of Automotive Engineers International, includes eight events ranging from design to endurance. The Northwestern team, which was competing for the first time in three years, just hoped to successfully compete in all the events. They did, and did fairly well in many events, including cost and design. Fueling issues knocked their car out of the endurance competition – it only made 19 of the 28 laps – and the team ended up 65th out of the 99 teams that made it to the competition. The team learned valuable lessons about testing time, competition logistics, and the importance of avoiding roadkill (a chance encounter with a possum may have damaged their car), and team members already started to use those lessons when they immediately began designing next year’s car.